From early tools to classic jewelry pieces, diamonds have come to represent many symbols across all eras and cultures. These unique stones hold something timeless about them, and yet our perception of them has also evolved over time. What are some of the symbols we associate diamonds with today? In this guide, we’ll explore the meaning behind diamonds. The word “diamond” originates from the Greek “adamao” which means “I tame” or “I subdue”, or possibly “adámas”, meaning inflexible or unbreakable. The latter became the de facto word to describe the hardness of diamond. History’s earliest record of the diamond dates back to 4th century BC in a Sanskrit manuscript from the northern Indian dynasty. During the 13th century, diamonds, along with pearls and gold, began to adorn European jewelry. Faceting was introduced three centuries later, as were the concepts of brilliance and fire. Around this time, laws were enacted that reserved the gemstone for royalty and aristocracy. By 1330, Venice was believed to be one of the first places to start the diamond-cutting industry, helping its trade with France and Belgium flourish. During this time, the diamond came to represent rarity and power, until a new discovery in the 1870s changed the industry. Diamond deposits were discovered in South Africa, and the gemstone quickly became a public commodity over the following year. Diamonds were now being traded worldwide and total trade exceeded 1 million carats for the first time ever. Today, diamonds are mined in 25 countries. We continue to develop new technologies to develop and understand the gemstone, and diamond production has reached a record high. Innovative marketing campaigns have transformed diamonds as a symbol of status to one of love, usually set in a ring given for engagements and weddings. These days, diamonds aren’t reserved for royalty, but for memorable moments and celebrations, from engagements to red carpet events. What is the symbolic meaning of a diamond? Diamonds have largely come to symbolize love and commitment. In the past, rings were without gemstones, but these days, wedding and engagement rings are often set with diamonds. You would have a difficult time finding a wedding ring that didn’t have a diamond or a similar alternative. Diamonds can also symbolize status and wealth. Just as the early royal families and aristocrats held collections of diamonds, it’s not uncommon to see diamonds adorn wallets, phone cases, bags, or even clothing. While diamonds have become more prevalent, they remain a luxury product, reserved for those who can afford it. Diamonds can represent beauty and extravagance. From Hollywood award shows to presidential dinners, diamonds can be found on jewelry and accessories besides rings, including necklaces, earrings, and watches. The way the light reflects and sparkles on a gemstone can be captivating and give a sense of elegance. Unfortunately, diamonds have also come to represent some of the worst tragedies and conflicts in our lifetime. The mining of the gemstone has resulted in child slavery and child soldiers, and even civil wars in Sierra Leone and Liberia. 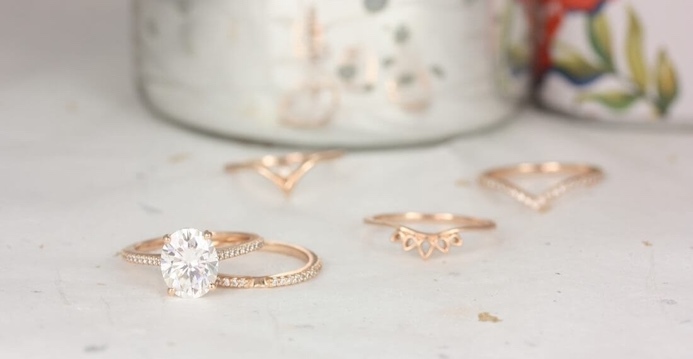 Love & Promise Jewelers has made it their mission to educate customers and ensures all our jewelry is fairly traded, conflict-free, and guilt-free. Learn more about our values here. Why are diamond rings a symbol of marriage? Since Ancient Egypt, rings have represented love and power. The ring or circle was viewed as a symbol of eternal life and love. That same view was adopted by the Greeks, the Romans, and eventually the entire world. As for the actual diamond, the hardness of the stone has become synonymous with the theme of love and union. Diamonds aren’t just tough, but they shine and sparkle like no other gemstone. Even the smallest rock can be as bright as the sun. And because they can be significant investments, diamonds represent a major long-term commitment. For all these reasons, diamonds have come to represent the purity and endlessness of love. Does the color of a diamond mean something? Color is one of the biggest factors in determining a diamond’s worth. The diamond color scale starts from D (completely colorless) and goes to Z (color diamonds). Generally speaking, pure white diamonds (D) are the rarest and tend to be the most expensive – however, certain color diamonds can be more expensive than Very Light Color diamonds (N-O-P-Q-R). Unless you purchase an artificially enhanced diamond, a diamond retains its color. You can learn more about the rating scale in our 4 C’s of Diamonds. What do other various gemstones symbolize? This is a common question- if diamonds mean love and status, how about other gemstones? Rubies – The best known red gem, Medieval Europeans came to look at rubies as symbols for health, wealth and wisdom. Sapphire – This blue gem has come to be associated with royalty and romance. Peridot – Ancient Egyptians recognized the Peridot as the “gem of the sun”. Topaz – Topaz has been known to symbolize love, fidelity, strength, and intelligence. Morganite – A beautiful peach hued gem, morganite embodies peace, compassion, promise, and healing. These are just a few of the many gems available at Love & Promise Jewelers. To learn more about other gemstones and their various differences, visit our page on Gem Differences. Shop for a wide variety of our gemstones here.